Some youngsters just exhibit a natural talent for sailing when they get out on the water – but for Isobel Mitchell, it might have come as a bit of a surprise because what she actually wanted to do was to windsurf. 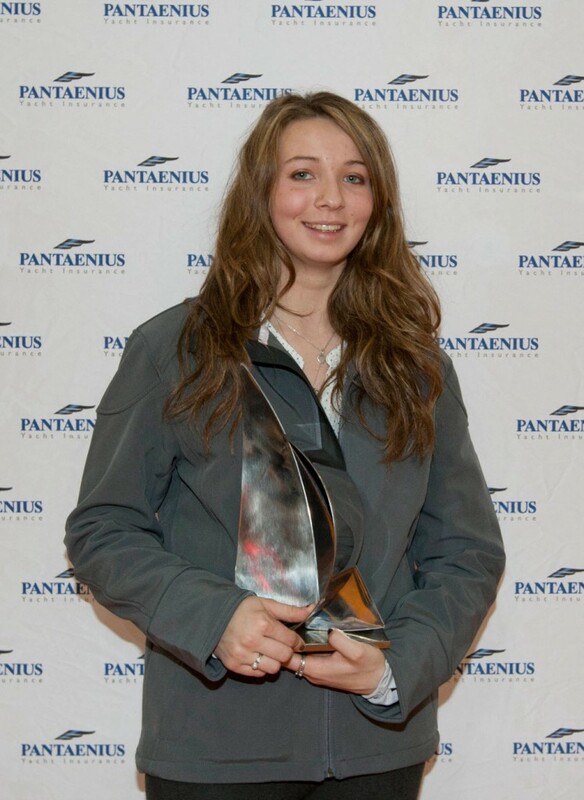 The 16-year-old from Barham Close in Weybridge has just won an award as the RYA’s Young Sailor of the Year for the Thames Valley and London region after an absolutely amazing set of performances on the water. Isobel started sailing the RS400 class dinghy with her helm, James George, at the Queen Mary Sailing Club (QMSC) in Ashford. James explained: “Her brother was UK Freestyle windsurfing champion in 2011 and Izzy began sailing when she was 13 – because she wanted to become capable of handling boats and windsurf equipment to help her become an assistant instructor. Izzy joined the QMSC youth sailing scheme in September 2010 and quickly showed that she had that happy knack of making a boat go faster. She won the QMSC Autumn, Winter, Frostbite, Spring and Summer series competing most Sundays against highly skilled and experienced crews in one of the largest 400 club fleets in the country. She scored 34 first places from 47 qualifying races. The highlight was the Winter series where Isobel came first in every single race. She then went on to race on the RS400 circuit at the major venues including Rutland and the National Sailing Academy once again producing results rarely outside the top five in a fleet which is renowned for ex-Olympic hopefuls such as Hugh and Sally Styles, Mike Simms and Nick Craig. Having only started sailing two and a half years ago, Isobel has had a fast and furious start to sailing taking large and small fleets on lakes, rivers and sea by storm in weather conditions often exceeding 30 knots. QMSC have identified Isobel as a rising talent and as well as having employed Isobel in her spare time to work at the club providing rescue cover, they have also trained Isobel to become a sailing instructor. And as if that extraordinary talent wasn’t enough, Izzy has also managed to notch up academic success with her GCSEs by securing 6 A*s, 5 As and 2 Bs. Many congratulations to Izzy – I expect to hear much more of her in the future. STILL focusing on the Queen Mary Sailing Club, I should also like to doff my hat to all those hardy souls who took part in the 39th annual Bloody Mary competition on the reservoir over the weekend of January 7-8.. The race took place in decent conditions with a good breeze and double digit temperatures following six days of gale force winds which meant the day before club members were still putting the club back together again! The event, which was started by Olympic medallist and club member Sarah Ayton, attracted 302 entries in 63 classes from 104 clubs from as far afield as Rock in Cornwall. A host of different classes took part including Toppers, Lasers, Solos, Fevas, Merlin Rockets, National 12s and Moths. Overall winner was Jason Belben from Stokes Bay in an International Moth. Mike Lennon, Ricky Tagg and Peter Barton followed him home also in their Moths. Winner of the Ladies’ Helm was Vikki Payne from Emsworth SC in a 29er. The first Queen Mary Helm was Valentin Nadyelkov in a Laser. For full results go to www.thebloodymary.org.uk.